We headed south for our final excursion of the trip. One of the places that we wanted to see while here was Cape Cod. The Cape is often the setting for articles in Esther's 'Coastal Living' browsing, and Falmouth, Buzzards Bay and Cape Cod Bay are regulars in small boat sailing lore. On our way to the Cape, we stopped in Plymouth and got the Pilgrim scoop. We also explored Falmouth and Hyannis among other spots as we made our way to the 'lower cape' Much of the Cape is shut down for the off season which makes it nice for getting around. But there are enough things open to keep it from feeling like a ghost town. 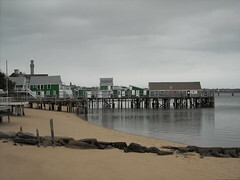 Tonight we are staying at the end of the Cape near the first landing of the Pilgrims in Provincetown. To catch some local flavor we ate at a Portuguese restaurant as there is an historical presence of the fishermen here.